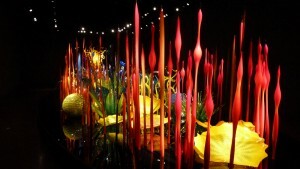 Do you know about Dale Chihuly? Have you ever seen his work? Do you even know the medium in which he works? Before I went to Seattle in 2013, I’d never heard his name. And now, I will never forget it. The Chihuly exhibit opened at the ROM recently, and you can explore an entirely new world for just $29. “I want people to be overwhelmed with light and colour in a way they have never experience” explains Chihuly, which is exactly how I feel when I am immersed in his work. What follows is a post I wrote in 2013 after my first visit to the incredible Chihuly Garden and Glass in Seattle. The ROM’s exhibit brought these feelings flooding back so I thought I should share them. One room had glass in the ceiling. Lit from above, it filled the room with glittering multicoloured lights that changed as you walked through the space. Looking up you got to see these abstract glass sculptures from a totally unique viewpoint. The walls glowed with a translucency rarely found in the real world. It was bright and airy. Ethereal, really. In another room Chihuly installed a glass garden. It was an oval shaped pedestal that ran down the room for 100 feet! It was filled with giant abstract blades of grass and flowers. It made you feel like Alice in Wonderland, travelling on the ground with the grass growing up beside you. The colours were bold primaries; using the organic shapes to give each piece it’s depth. It was a world of wonders that I strolled around a number of times before I felt like I could move on. I was inspired. I was in awe. I had no idea glass could look so inviting. I learned that primary colours could give a feeling of youthfulness and joy, and yet be elegant at the same time. I realized that shapes could combine to be supple and hard. I discovered that lighting is the key to making it all happen. I want to take that awe and wonder and translate it into your next event. I want to use primary colours in the décor. I want to have bright, saturated lighting. I want to mix hard and soft elements in the lounge. I want to build a glass garden for your table. What do you think? Do you want Chihuly to inspire your next big event?” Be sure to visit the ROM by January 2nd to be inspired.